Parenting is not the easiest job in the world. Many people become parents without really planning to, and many people just want to wing it. In spite of wanting to wing it, many parents realize there is a need to be cautious so as not to raise children of despicable character. It is a battle of wills – giving your child everything versus making your child grow up the way you did, where the word “No” was a chorus your parents sang whenever you wanted something that could put you in the same league as your friends. The truth is many parents are torn even though they would not admit it. Should you give your child everything and risk raising a monster you cannot handle in future, or should you implement austerity measures that instill fear in your child and risk your relationship? Don’t despair; you can give your child everything. Contrary to what many people may believe children of good character are not raised by using deprivation as a tool nor are monsters raised if a child gets everything. The key is in the approach you apply as a parent and the measures you put in place to ensure your children do not feel entitled. Recently, my thoughts drifted to actions and rewards, and it got me thinking about how children are raised. The big mistake parents make in a bid to show they love their children is that they give them everything without letting them earn anything. A TV show I watched a while ago was about a super-nanny who went to troubled homes to sort the children lout. Her approach was simple - do your house chores for the day, and earn your phone and TV privileges. Make a fuss about doing your share of the housework, and lose your privileges. It was that simple. You can give your children everything without making them feel entitled. You can teach them that everything they desire in life requires work, and until that work is duly completed, they cannot expect to earn rewards. It may seem like a small lesson, but it has far-reaching effects. It will teach them to understand that their dreams require work and dedication. Completing a degree requires work and dedication, even building a good relationship requires work and dedication. You can give them everything if you make them earn it, and still raise them to be respectable citizens of society. By teaching your children to earn everything they desire, you are deeply instilling in their character the best life lesson you will ever teach them – Nothing good comes easy; if you want the fun, be ready to do the work. As a parent, get involved too! Let the work be fun for them. 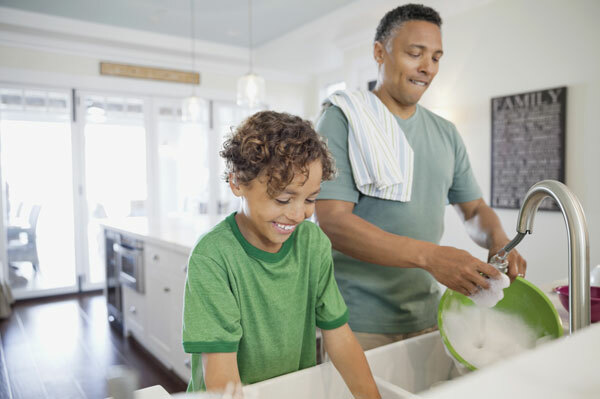 Do your chores alongside theirs, tell them stories or jokes. Make them understand that working to earn something does not have to be a painful process filled with murmuring and tears. You can give them everything and still raise them to be children you can be proud of.